Data Center Design: How Does a Developer Meet Today's Requirements? You are here: Home / Downloads / Data Center Design & Construction: How Does a Developer Meet Today’s Diverse Requirements? 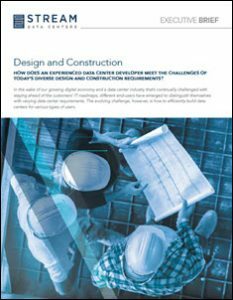 White Papers > Data Center Design > Data Center Design & Construction: How Does a Developer Meet Today’s Diverse Requirements? In the wake of our growing digital economy and a data center industry that’s continually challenged with staying ahead of the customers’ IT roadmaps, different end-users have emerged to distinguish themselves with varying data center design requirements. The evolving challenge, however, is how to efficiently build data centers for various types of users. Capacity – maintain ample availability of land, space and power, to balance supply and demand. Establish key performance indicators (KPIs) – never lose sight of KPIs such as health and safety, efficiency or quality metrics. Speed to market – partner with a loyal and dependable supply chain to easily meet timing and delivery expectations. Stay ahead of market needs – keep construction-ready sites available for immediate build-to-suit or modification, so customer operators do not have to start their data center projects from scratch. Listen and respond to every customer’s specific concerns – to furnish the right product at the right time, and ensure alignment across all design and construction channels. The new white paper from Stream Data Centers explores the differences between enterprise users and cloud providers as two examples of data center users who present contrasting challenges in design and construction requirements.